This review is written by Barry Sheppard, a longtime friend and comrade of Peter Camejo. Chicago: Haymarket Books, 2010, $15 paper. This book by Peter Camejo, who was an important figure in the radicalization of “The Sixties” and beyond — up to his untimely death in 2008 — should be read by veterans of the socialist movement and wider social causes. It also should be read by new activists thirsty for understanding of previous struggles in order to better equip themselves for present and future battles. Additionally the book is a good read. The first chapter is set in 1979, out of chronological order from the rest of the book. It explains how the CIA attempted to get Peter arrested in Colombia, on a leg of a speaking tour in South America. If he had been imprisoned there it is possible that he would have been “disappeared.” Without giving away the story, Peter escaped this fate through an unlikely intervention, quite a tale in itself. As Peter explains, the two of us met each in college, collaborated and then joined the Socialist Workers Party at the same meeting in Boston in November 1959. I was 22 and Peter 20. We became leaders of the party’s associated youth group, the Young Socialist Alliance. In 1960 and 1961 a dispute over the Cuban Revolution broke out in the SWP and YSA. The majority in both groups supported the Revolution and its leadership (with criticisms). Peter and I supported the majority position, and became its primary spokespersons in the YSA. As a result, I became the national chairman and Peter the national secretary of the YSA and we moved to New York. Soon, along with others from a new generation, we joined with people from older generations in the leadership of the SWP. Peter left the SWP in 1981. After that he remained active in promoting various attempts to rebuild the American left, culminating in his running as the Green Party candidate for governor of California in 2002 and 2003, and then as independent candidate Ralph Nader’s running mate in the Presidential elections of 2004. His experiences as a leader of the YSA and SWP, and his subsequent activities, form a major part of his memoir. In this review I will concentrate on this aspect. There are three political threads that run through the book. One is that social change comes about through the action of masses of people. Related is the theme that attempts to circumvent mass action by the activities of small groups engaging in what they think of as “exemplary” actions of a few are an obstacle to social change. Two variants of this viewpoint are ultraleftism and sectarian abstention. The third theme is the need to break from the stranglehold of the parties of “money” as Peter puts it, the Democrats and Republicans. Peter’s experiences as a leader in the anti-Vietnam-War movement are vividly portrayed. One is his speaking before a crowd of 100,000 on the Boston Common as a spokesperson of the Student Mobilization Committee Against the War in Vietnam as part of the 1969 Vietnam Moratorium. There is a gripping account from a political opponent from the Democratic Party describing how Peter was by far the best received speaker of the day. In fact, Peter was the best public speaker of our generation in the SWP and YSA, and, I think, of the youth radicalization as a whole. 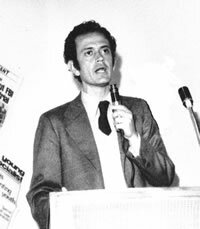 Peter had moved from New York to Berkeley, California in late 1965, at the request of the SWP and YSA. The San Francisco Bay Area had become a center of the new student movement, and the University of California at Berkeley especially so. Peter enrolled in the University, and quickly rose as a leader of the antiwar movement and the student movement in general there. He outlines differing perspectives that emerged in the antiwar movement. One was that the movement should orient toward the Democratic Party. The Communist Party put forward this perspective, but also would endorse mass actions especially during periods between elections. Another was associated with the national leaders of the Students for a Democratic Society, who, while calling for the first massive action in 1965, had subsequently turned their backs on mass action and increasingly championed small vanguard actions and then minority violence. The third approach, which we supported, was to further mass actions in the streets independent of both capitalist parties. To do this, we focused on building broad antiwar formations around the “single issue” of opposition to the war. All, regardless of their political views on other questions, were welcome to join. Within such coalitions, Peter explains, we argued for taking an “Out Now!” position, calling for immediate withdrawal from Vietnam. It took some years before “Out Now!” became the widely accepted goal of antiwar demonstrations. Another key point we raised was non-exclusion. While independent of the Democrats and Republicans, we argued, the antiwar movement would welcome politicians from those parties who were against the war, on the principle that the movement had to be non-exclusionary. In practice, there were very few such politicians. It was on this basis that the large antiwar demonstrations that reached into the hundreds of thousands were organized. An aspect of our approach was to build antiwar committees both locally and nationally by putting decision making in the hands of the activists themselves. Votes would be taken by the assembled activists after open debate. Most often our mass action perspective would carry the day, which led many others with opposing perspectives to charge that we had mechanical majorities of our own members at such meetings. But we never became anywhere near that large, although we did grow substantially during this period. Our arguments simply made sense to the majority of antiwar activists. This approach also raised the self-confidence of the participants, who became more dedicated to building the mass actions as a result. Peter concludes that the SWP played a crucial and positive role in the antiwar movement. Peter himself was an important part of that effort. There is a riveting chapter on what became known as “the battle of Telegraph Avenue.” This street abutted the Cal campus. In May-June 1968 there was a massive student-worker uprising in France which galvanized the world. Our young French cothinkers played an important part in these events. We organized support meetings and picket demonstrations in solidarity. In Berkeley, Peter met with other campus leaders to organize a big meeting on Telegraph Avenue. The SWP and YSA reached out to involve other organizations, but Peter was recognized as the main leader of the event. The rally was set for June 28. The Berkeley City Council voted down the organizers’ request to shut down a short stretch of the Avenue next to the campus for the event. So there was agreement that the participants would stay on the sidewalks. Monitors were stationed to help keep the crowd on the sidewalks. But then the police attacked. The students fought back as best they could. The next days and nights were marked by increased police violence, all of the city of Berkeley was placed on nighttime curfew, and mass meetings of the young people who fought against these violations of their rights to free speech and assembly. Finally, the city backed down and allowed the rally to proceed on Telegraph Avenue on July 4. Peter’s account of how this victory was won makes for exciting reading, but more important are the lessons to be drawn. There was a big difference between the physical showdown between the mass of student protesters and the cops, and the actions of violence even bombings carried out by small groups believing they were “sparking” the mass movement. In contrast to such futile “offensive” actions, the protesters of Telegraph Avenue were defending their fundamental rights. All of their decisions were made at mass meetings after open debate. Their most important decision was to defy the city authorities by going forward to hold a rally on July 4, come what may. They knew that this could mean a violent confrontation with the police. They had already suffered casualties, and understood what this could mean. It was this resolve that forced the City Council to back down. An important aspect of the leadership of the SWP and YSA and Peter himself was to reach out to the citizens of Berkeley, the fight for public opinion. Initially, this was against the students. But through careful tactics aimed at bringing the truth of the situation to the public, that the city authorities were trampling on rights guaranteed in the U.S. Constitution, the mood in the city swung over to support them. The over-reaction of the police, by attacking bystanders and even people in their homes, was a factor. Police always go too far in such situations, but this truth had to made widely known. In every way, Peter’s leadership was geared toward mass mobilization and mass action. The third thread that runs through the book from beginning to end is the need to break from the Democratic and Republican parties. This was an aspect of our insistence that the antiwar movement be focused on independent mass actions in the streets not subordinate in any way to the twin parties of “money.” It was projected in the small example set by SWP election campaigns, from the first one Peter and I participated in, Farrell Dobb’s 1960 Presidential campaign with Myra Tanner Weiss as his running mate, through Peter’s own campaigns for the mayor of Berkeley, U.S. senator from Massachusetts, and his 1976 campaign for President with running mate Willie May Reid. After he left the SWP, Peter supported the independent campaigns of the Green Party, including Ralph Nader’s 2000 run for President, Peter’s own campaigns for Governor of California in 2002 and 2003, and as independent Ralph Nader’s running mate in 2004. Peter’s last battle was to keep the Green Party independent from the Democrats, a fight which he lost at the national level as is well documented in the book, although some local Green Party groups do maintain their independence. A comment is order here. There are some splinters of the Trotskyist movement who have attacked Peter’s support of independent Green Party election campaigns. Their argument is that the Greens are not a socialist party, nor do they have a base in the trade unions. These groups (including the rump which still uses the SWP name), say they would vote for a Labor Party if the trade unions organized one, claiming that it would be a workers’ party. They point to Lenin’s position in 1919 that the newly formed British Communist Party should vote for the Labour Party. They leave out that Lenin also said that the British Labour Party was a bourgeois party through and through, and an imperialist party to boot. He urged the young CP to vote for this imperialist capitalist party anyway, to reach out to the British workers whose trade unions had created it. The weird logic of the sectarian argument ends up urging a vote for the Labour Party of Tony Blair and Gordon Brown, while opposing a vote for the anti-imperialist, pro-working class Ralph Nader. It is true that the U.S. Green Party is a petty-bourgeois (and thus bourgeois) party, but it is not a party of the big bourgeoisie nor is it an imperialist party. Unfortunately, on a national level it is now on a slippery slope towards supporting the imperialist Democratic Party. In many countries, the Greens have already gone over to finance capital. A bright spot Peter points to was the 2000 campaign of Nader for President on the Green Party ticket. Tens of thousands packed Nader rallies in many cities, more than those of the two capitalist parties. These rallies were mainly young. A central aspect, evident in the shouts and applause of these young people, was their identification with the big anti-globalization demonstration in Seattle the year before. A new movement had appeared, inexperienced, new to radical ideas, but moving in an anti-capitalist direction – and full of the energy and enthusiasm of youth. Peter doesn’t mention this background to the Nader campaign, but this must be an oversight. We both were present at the Oakland, California, Nader rally and saw these anti-globalization young people firsthand. Nader reacted to the shouts of the crowd, absorbing their energy, and his speech became more and more radical, which furthered the excitement of the audience. This anti-globalization movement was cut short by the chauvinism and war mongering whipped up by the Bush administration, the Congress to a person, and press after 9/11. The movement continued elsewhere, but was silenced in the U.S. This was the major factor in the success of the subsequent Democratic Party anti-Nader campaign that reached into the Green Party itself. Figures like Noam Chomsky, Howard Zinn, Media Benjamin and Michael Moore capitulated. Not content with only their ideological campaign, the Democrats launched a series of despicable dirty tricks to keep the Nader-Camejo ticket off the ballot. This part of Peter’s book graphically explains the obstacles we face in breaking the two-party stranglehold. Peter writes that in 1984 he made a “major political mistake” in supporting the campaign by Jesse Jackson in the Democratic Party Presidential primaries. A detail that Peter omits was that after Jackson lost, Peter supported the Democratic candidate Walter Mondale in the general election. After Peter left the SWP in 1981, I hadn’t had contact with him. In 1984, I happened to be walking by a Mondale street rally in New York, and ran into Peter, who handed me a vote Mondale leaflet. This seemed to me at the time to validate charges by the SWP leadership that Peter had moved way to the right. An important appendix is a short essay on the origins of the two-party system, going back to the foundations of the United States, and up through the Civil War and beyond. He shows that in fact the present Republican and Democratic parties emerged from a single party, the Republicans, after the Civil War. This appendix should be reprinted as a pamphlet for the new generations who will become radicalized in the future. There is a chapter on how Peter became a stockbroker, and how he helped set up a firm, “Progressive Assets Management.” The idea was that Peter would invest money for those who didn’t want to invest in firms doing business in apartheid South Africa, polluters, and so forth. There was an element of self-deception in this undertaking, as the control of the economy by financial capital makes it virtually impossible to know where investments go, except for some start-ups like solar power firms. This chapter is interesting, however, in explaining the obstacles the powers that be put in the way of Peter’s progressive projects. His outline of how workers’ pension funds are controlled by capital is revealing. When my companion, Caroline Lund, and I reconnected with Peter it was after we had left the SWP some years earlier. We had moved to the San Francisco Bay Area. It was in the early 1990s when we first talked. In discussing what had happened to the SWP, Peter said that the fundamental question was that the program of the SWP was wrong. Since this theme is a major one in his book book, and since I disagree with him, I will take this up in some detail, both to disclose my bias and to explain Peter’s views in the latter part of his life more clearly. Peter told me this disagreement represented a “profound difference” between us. I agree. This is wrong on several counts. A minor distortion is the assertion that our newer members “were middle class youth.” Most of our recruits in this period had come from the campuses, were students. Students come from all classes, from the bourgeoisie like Peter, from “middle class” families (working farmers, small business people, lawyers, self-employed and so forth) and from blue and white collar workers. After the Second World War, there was an explosion in education which drew in millions from working class families. Most of our recruits came from this latter section which was the majority among students, but we recruited from all these backgrounds. To Peter’s main point. The “worker-based” older cadre had come to grips with analyzing the Chinese and Vietnamese revolutions prior to the radicalization of “The Sixties” but which greatly influenced our generation. These revolutions had come to power under Stalinist leaderships, something which our program had deemed extremely unlikely. The SWP modified its program accordingly. A new challenge was the Cuban Revolution, unfolding as Peter and I joined the SWP, which was led by non-Stalinist but not socialist forces (they became socialists in the course of the Revolution). Our program was further modified as we embraced the Cuban Revolution, an important context of the youth radicalization. Our fundamental strategy and tactics in the antiwar movement (well explained by Peter) were first developed by the “older, primarily worker-based” party leadership, and which the younger leaders then also helped shape. It was the older comrades who developed the party’s positive appreciation of Black Nationalism against the opposition of almost all other socialist tendencies, and developed a far-reaching program for the Black liberation movement. It was younger leaders who analyzed the world-wide youth revolt, developed a new program in relation to it, with enthusiastic support of the older comrades. The same was true of the new women’s liberation movement. The younger members and leaders had the full support of the older comrades in all of these “contemporary” issues. Opposition to our embracing of the new issues of the 1960s radicalization did develop in the party and YSA. This came not from the older comrades (with one or two exceptions) but from a small minority of the newer members, who did charge that the party was abandoning its program. This was a reflection among our student recruits of outside forces, especially the national leadership of the Student for Democratic society, who did turn their backs on the youth radicalization in a “workerist” direction. This small minority of our student youth was soundly defeated in the SWP and YSA. There was some opposition to our fully embracing the gay liberation movement from some older comrades and some younger ones, too. This had nothing to do with fearing for our program, but was an expression of prejudice, pure and simple, in the wider working class at the time. Marxist written documents “from the past,” beginning with the Communist Manifesto, are essential to understand the present and to effectively intervene in it. The “living mass struggles” of the present grow out of those of the past. The written programmatic documents of Marxism are rich with the lessons of these past struggles. They do show development of course, since they reflect changing reality, but they also provide continuity. Neither reality nor Marxist theory (program is another word for theory) is always just coming into existence independent of the past. Peter’s own history attests to this. Peter didn’t invent the need to break with the Democrats and Republicans. He learned this from the program of the Socialist Workers Party. His book has a chapter on Stalinism. He was taught to understand Stalinism by the SWP, which based its understanding on the programmatic work done by Trotsky. When Peter and I joined the SWP the two larger socialist groups, the Communist Party and the Socialist Party, rejected the need to break with the Democrats and rejected Trotsky’s analysis of Stalinism. The “single issue” and mass action perspective of the SWP in the antiwar movement was an adaptation of the united front tactic developed by the early Communist International, codified in “written documents.” What Peter learned about Malcolm X from the SWP was developed from “written documents” of the Bolsheviks on the national question. And so forth. Marx wasn’t the first to raise that society can transcend the present order. All socialists before Marx believed this, and were devoted to the cause of the working people and the oppressed. Marx’s unique contribution was his program of how this will (not “might”) come about. He didn’t “attempt” to do so, he did so. His program in its essence is that the modern working class which capitalism has produced is in an irreconcilable class struggle with the capitalists, and will lead all the oppressed in a revolution that will overthrow capitalist rule and take state power. It will use that state power to build over time a society without classes. To accomplish this historical task, the working class will have to develop consciousness of itself as a class and form a political party (or parties). Peter nowhere affirms Marx’s program, and appears to reject it by omission. That is, he rejects much more than the SWP’s program. In the place of program and theory he presents an agnostic view: “The science of social change is permanently evolving. We will learn what works – that is what is ‘true’ – by the inevitable conflict of ideas and by testing those ideas against reality.” What “works” is what is “true” – a restatement of American pragmatism. We don’t yet know what “works,” including Marx’s program, Peter seems to be saying. Peter believes, as do Marxists, that a Third American Revolution is on the historical agenda. An important part of his book is devoted to the idea that this revolution will be an extension of the first two, the War of Independence and the Civil War, which centered on the fight to extend democracy. “I am convinced the struggle will appear as a fight for democracy and will develop around very concrete issues of a defensive nature,” he writes. In the mid-1970s, as he was first developing his new ideas, Peter told me that the coming revolution will be fought around democratic demands, “not class demands.” Peter’s view is reflected in the title of his book, “North Star.” He took this term from the name of the abolitionist newspaper published by the great former slave Frederick Douglas in the fight against slavery. Democratic demands will be very important, including the unfinished democratic tasks from the first two revolutions such as ending the continued oppression of Blacks. But so will the specific class demands of the workers, including the need for them to take state power, or there will be no revolution. The Third American Revolution will be a proletarian revolution for socialism. The first two American Revolutions consolidated the rule of the capitalist class. The Civil War clinched this by overthrowing and expropriating the slave owning class. In class terms, the Third will overthrow the capitalist class and consolidate the rule of the working class through the formation of a democratic workers’ state and the expropriation of the capitalist class. The workers’ state will gradually move toward the withering away of all classes and the state itself. Peter is right that we should assimilate the democratic victories of the War for Independence and the Civil War and identify with their leaders. But our American revolutionary heritage goes beyond that. We identify with the suffragettes, the decades-long battles against Jim Crow, and their many leaders including Susan B. Anthony, W.E.B DuBois, Malcolm X and Martin Luther King. The first stirrings of the labor movement in the later 1880s, the IWW and the Socialist Party, the formation of the Communist Party and the SWP are also part of our heritage, as is the great labor upsurge of the 1930s. These movements threw up leaders we seek to emulate, too – and they put class demands at the center of the coming revolution. Malcolm X was moving toward socialism when he was gunned down. Martin Luther King saw at the end of his life that it was necessary to begin fighting for economic, working-class demands – he was assassinated assisting striking Black waste workers. Our generation of “The Sixties” also developed leaders and organizations of women, gays, youth, Blacks, Chicanos, socialists and more, who combined democratic and working class demands. I realize that my reaffirmation of Marx’s view of the dynamic of class struggle under capitalism and its outcome is a minority one within the broad progressive movement and even among socialist organizations, and that many readers of Peter’s book will agree with him. This is quite true today, in the aftermath of the disintegration of the Soviet bloc, the feebleness of the labor movement in the face of the capitalist offensive, and the shrinking and divisions within the socialist movement. There has been a degeneration of the SWP, signs of which appeared in the 1970s, and which accelerated after 1980. Peter attributes this to Trotskyism itself, which inevitably produces sectarianism, splits and cults. He points to undoubted true examples. But there are glaring contradictions to his view. If the SWP was always inflicted with these diseases (since it undoubtedly was Trotskyist), there was no degeneration, only a continuation. The SWP that Peter and I joined was not sectarian. It certainly was not a cult of an individual. Its leadership team was composed of very independent and strong individuals, such as James P. Cannon, Farrell Dobbs, Tom Kerry, Murry and Myra Weiss, George Novack, Evelyn Reed, Karolyn Kerry, Joe Hansen and many others. The European Trotskyist parties on the whole were not sectarian or cults, and aren’t to this day. The picture of the SWP and his participation in it and the movements of the radicalization of “The Sixties” Peter outlines are positive, overall. He clearly enjoyed those days and regards them as a high point of his life. This stands in contrast to many who left the SWP and have become bitter about their own youth. I’ve taken the space to explain my differences with Peter because they are fundamental, but in spite of these differences we remained friends. I supported Peter’s attempts to further the struggle against the parties of “money” in the 1990s and 2000s, which he explains in his book. The 2000 Nader campaign, and his own election campaigns for governor stand out. One instance I particularly remember was in his 2002 campaign. Peter had championed the cause of the undocumented workers vigorously in this campaign, as he did before and after. My companion Caroline Lund and I joined a long march of 500 such workers in Santa Rosa, north of San Francisco, on a cold day, which ended up in a spirited rally addressed by Peter in Spanish. From time to time Peter would telephone me to get my opinion during these campaigns. He also would call me to check my memory of events as he was writing the book. There are factual errors that crept in, probably because he was pressed for time and did not have the opportunity to consult the written record, but most do not affect the thrust of the book. One, however, should be corrected, as it misrepresents the views of an important figure in the Marxist movement, Ernest Mandel. During the first days of the Nicaraguan revolution, a current of the Trotskyist movement relatively strong in Latin America led by Nahuel Moreno, which had split from the Fourth International, had formed an armed column called the Simon Bolivar Brigade. The SBB entered the Atlantic Coast of Nicaragua, which was demographically and geographically separate from most of the country, and attempted to set up local governments there. The Sandinista leadership of the revolution was concerned, of course, and moved to expel them. Peter writes that Mandel, a central leader of the Fourth International in Europe, supported the SBB. I was part of the FI leadership in Paris at the time, and know this is not true. The whole of the FI repudiated Moreno’s adventure. A close friend of Mandel’s in Mexico, Manuel, who was also a leader of our group there, was dispatched to Nicaragua to explain our position. It is possible that Peter confused something that had occurred years earlier during the Portuguese revolution when there was a temporary political agreement between Mandel and Moreno. However, the false picture Peter presents of Mandel’s and other European leaders’ view of the Nicaraguan revolution extends beyond the Simon Bolivar Brigade. These leaders wholehearted supported the revolution, and sent many delegations to Nicaragua to learn about it first hand and returned to build solidarity in their countries. Peter also claims that at the November 1979 World Congress of the FI, the majority of the European leaders expressed hostility to the Sandinistas. There were two resolutions on Nicaragua presented to the Congress, but both were in support of the revolution, while having a theoretical difference. I wish Peter had checked with me on this, because I am sure that if he had he would have realized that his memory of these events was faulty. Peter’s honesty and selfless devotion to working people and all the oppressed marked his entire conscious life, and these qualities shine through the book. When my companion, Caroline Lund, was dying of ALS (Lou Gehrig’s disease) in 2006, we held a big party for people to say goodbye to her. Peter was there, and a photo of him, Caroline and myself was taken, which I treasure and still keep. At that party Peter did not yet know of the cancer that was developing in his body, and which would take his life. Peter also spoke at Caroline’s memorial meeting, and noted that she was a very kind person. This was one of Peter’s personal qualities, too.